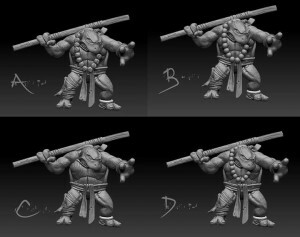 Greebo is showing off these 3D renders for an Adolescent Martial-Artist Amphibian (note: that's my name for it, not necessarily theirs) and want to know what version you like the most. We need your hint. Which model do you prefer?